“Researchers at TU Delft have developed a highly sensitive and versatile hydrogen sensor that works at room temperature. The sensor is made of a thin layer of a material called tungsten trioxide. Hydrogen has the potential to replace fossil fuels as the most important energy carrier in the near future. It has the highest energy per mass of any fuel and can be produced sustainably. However, it is also flammable, making sensors that can detect it an absolute necessity for the transition to a hydrogen economy. Various types of hydrogen sensors already exist, but most of these sensors require high temperatures in order to function. Researchers at TU Delft have now developed a sensor that works at room temperature. The new sensor is made of a material called tungsten trioxide. One of the properties of tungsten trioxide is that its crystal lattice structure contains a lot of open spaces. As a result, the material can easily be doped, which is the practice of changing its electronic properties by introducing other atoms. It turns out that it can. The researchers first created thin sheets of tungsten trioxide using a method called pulsed laser deposition. That way, they were able to deposit single layers of the material onto a substrate one by one. “Using this method, we created sheets of tungsten trioxide with a thickness of only nine nanometres”, said Mattoni. 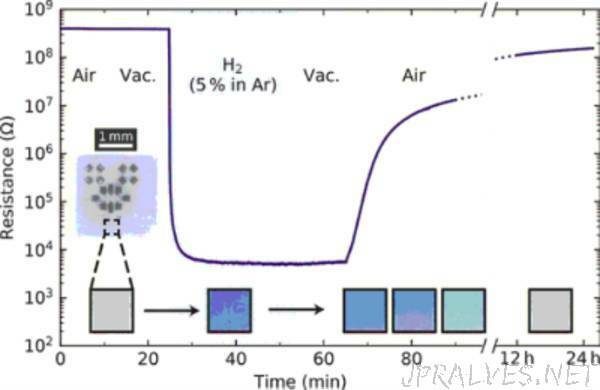 The researchers then put platinum droplets on top of the thin layers of tungsten trioxide. Platinum is well known to function as a catalyst which separates the hydrogen molecules into single hydrogen atoms. These atoms, the researchers observed, could then enter the lattice structure of tungsten trioxide, slowly turning it from an insulator into a metal. “This means that, by measuring the resistance of the material, we can determine the amount of hydrogen present in the environment”, Mattoni explained.